New Today: Millersville Borough Veterans Memorial Ceremony: Nov. 12 @ 10:30 a.m.
New Today: EXTENDED: Have You Signed the It’s On Us Pledge? 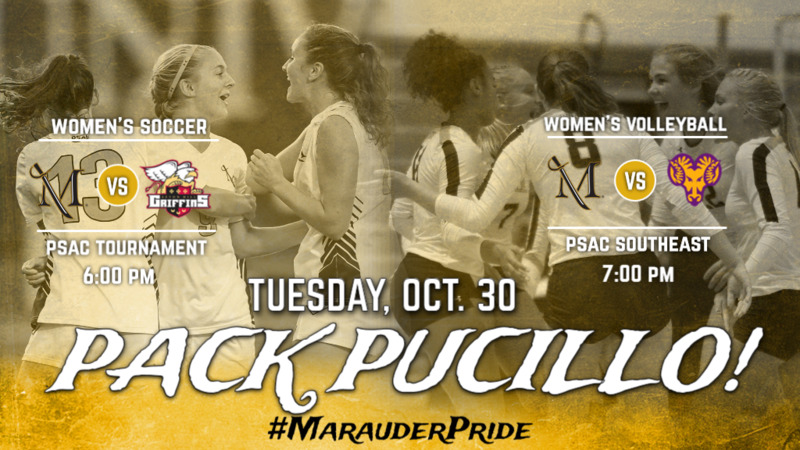 New Today: Women’s soccer hosts PSAC Quarterfinal; 6 p.m. & Women’s volleyball hosts rival West Chester; 7 p.m.
New Today: Pink Patch T-Shirts for Sale at Juice Bar, 11 a.m. – 1 p.m.
Diversity to Inclusion Open Forums – Join Us! Have you been inside the Lombardo Welcome Center yet? New Today: Donuts? Yes! Join us for casual conversations on Nov. 2! Oct. 31- Field hockey at Bloomsburg, 4 p.m.
Volleyball vs. Kutztown, 7 p.m.
Women’s Rugby Tournament, 9 a.m.
Field Hockey vs. Mansfield, 12 p.m.
Volleyball vs. East Stroudsburg, 1 p.m.
Football vs. Kutztown, 4 p.m.